Abandoned monitor and computer parts. Electronic waste, "e-waste," or "Waste Electrical and Electronic Equipment" ("WEEE") is a waste type consisting of any broken or unwanted electrical or electronic appliance. It is a point of concern considering that many components of such equipment are considered toxic and are not biodegradable. 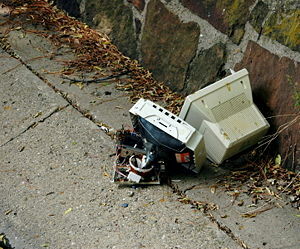 Electronic waste includes computers, entertainment electronics, mobile phones and other items that have been discarded by their original users. While there is no generally accepted definition of electronic waste, in most cases electronic waste consists of electronic products that were used for data processing, telecommunications, or entertainment in private households and businesses that are now considered obsolete, broken, or unrepairable. Despite its common classification as a waste, disposed electronics are a considerable category of secondary resource due to their significant suitability for direct reuse (for example, many fully functional computers and components are discarded during upgrades), refurbishing, and material recycling of its constituent raw materials (listed below). Reconceptualization of electronic waste as a resource thus preempts its potentially hazardous qualities. In 1991 the first electronic waste recycling system was implemented in Switzerland beginning with the collection of refrigerators. Over the years, all other electric and electronic devices were gradually added to the system. Legislation followed in 1998 and since January 2005 it has been possible to return all electronic waste to the sales points and other collection points free of charge. There are two established PROs (Producer Responsibility Organisations): SWICO mainly handling electronic waste and SENS mainly responsible for electrical appliances. The total amount of recycled electronic waste exceeds ten kg per capita per year. The European Union is implementing a similar system described in the Waste Electrical and Electronic Equipment Directive (WEEE). By the end of 2006—and with one or two years' delay for the new EU members—every country has to recycle at least four kg of e-waste per capita. Electronic waste is a valuable source for secondary raw materials if treated properly, however, if not treated properly, it is a major source of toxins. Rapid technology change, low initial cost and even planned obsolescence have resulted in a fast growing problem around the globe. Technical solutions are available but in most cases a legal framework, a collection system, logistics and other services need to be implemented before a technical solution can be applied. Due to lower environmental standards and working conditions in China, India, Kenya, and elsewhere, electronic waste is being sent to these countries for processing—in most cases illegally. Delhi and Bangalore in India and Guiyu in Shantou region of China have electronic waste processing areas. Uncontrolled burning and disposal are causing environmental and health problems due to the methods of processing the waste. Trade in electronic waste is controlled by the Basel Convention. Electronic waste is of concern largely due to the toxicity of some of the substances if processed improperly. The toxicity is due in part to lead, mercury, cadmium and a number of other substances. A typical computer monitor may contain more than six percent lead by weight. Up to 38 separate chemical elements are incorporated into electronic waste items. The unsustainability of discarded electronics and computer technology is another reason for the need to recycle—or perhaps more practically, reuse—electronic waste. Electronic waste processing systems have matured in recent years following increased regulatory, public, and commercial scrutiny, and a commensurate increase in entrepreneurial interest. Part of this evolution has involved greater diversion of electronic waste from energy intensive, down-cycling processes (eg. conventional recycling) where equipment is reverted to a raw material form. This diversion is achieved through reuse and refurbishing. The environmental and social benefits of reuse are several: diminished demand for new products and their commensurate requirement for virgin raw materials (with their own environmental externalities not factored into the cost of the raw materials) and larger quantities of pure water and electricity for associated manufacturing, less packaging per unit, availability of technology to wider swaths of society due to greater affordability of products, and diminished use of landfills. Challenges remain, when materials cannot or will not be reused, conventional recycling or disposal via landfill often follow. Standards for both approaches vary widely by jurisdiction, whether in developed or developing countries. The complexity of the various items to be disposed of, cost of environmentally sound recycling systems, and the need for concerned and concerted action to collect and systematically process equipment are the resources most lacked—though this is changing. Many of the plastics used in electronic equipment contain flame retardants. These are generally halogens added to the plastic resin, making the plastics difficult to recycle. In the 1990s some European countries banned the disposal of electronic waste in landfills. This created an e-waste processing industry in Europe. Early in 2003 the EU presented the WEEE and RoHS directives for implementation in 2005 and 2006. Some states in the U.S. developed policies banning CRTs from landfills. Some e-waste processing is carried out within the U.S. The processing may be dismantling into metals, plastics and circuit boards or shredding of whole appliances. From 2004 the state of California introduced a Electronic Waste Recycling Fee on all new monitors and televisions sold to cover the cost of recycling. The amount of the fee depends on the size of the monitor. That amount was adjusted on July 1, 2005 in order to match the real cost of recycling. A typical electronic waste recycling plant as found in some industrialized countries combines the best of dismantling for component recovery with increased capacity to process large amounts of electronic waste in a cost effective-manner. Material is fed into a hopper, which travels up a conveyor and is dropped into the mechanical separator, which is followed by a number of screening and granulating machines. The entire recycling machinery is enclosed and employs a dust collection system. The European Union, South Korea, Japan and Taiwan have already demanded that sellers and manufacturers of electronics be responsible for recycling 75 percent of them. Many Asian countries have legislated, or will do so, for electronic waste recycling. The United States Congress is considering a number of electronic waste bills including the National Computer Recycling Act introduced by Congressman Mike Thompson (D-CA). This bill has continually stalled, however. In the meantime, several states have passed their own laws regarding electronic waste management. California was the first state to enact such legislation, followed by Maryland, Maine, and Washington. Free Geek - Recycling and re-using computer equipment based on the 'Free to all' philosophy. ↑ Umwelt Schweiz Retrieved November 11, 2006. ↑ Swico, SWICO. Retrieved November 11, 2006. ↑ SENS, SENS. Retrieved November 11, 2006. This page was last modified on 15 September 2017, at 19:14.